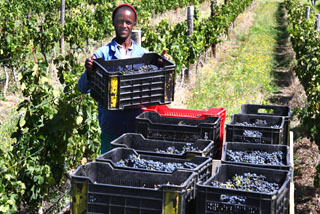 An initial 18 Ha/44acres were planted to vine in 1997 since which time further plantings have progressively taken place. In any vineyard, it is a fact that fundamentally, the quality of the grapes determines the potential for quality in a wine. However, there are many variables that will influence its ultimate character. Start by understanding the intricacies that comprise the terroir, and achieve a balance between the agricultural aspects, and those of the surrounding natural environment. Get in touch with every feature of each given season, from pruning to determination of optimum ripeness, and know the effects of climate and viticultural conditions on the grapes at harvest to harness the characteristics that will give the wine its distinguishing features. 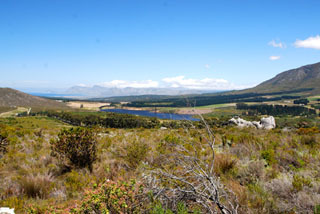 Approximately 30% (65ha 165acres) of the property is virgin fynbos, which is the natural scrubland vegetation occurring in a small belt of the Western Cape. This has been sectioned off, and declared as exclusive natural areas for the preservation of the flora and fauna. The only control carried out is that of firebreaks and alien vegetation eradication. We allow our vines to exist in as natural an environment as is practicable. There are permanent swards of indigenous grasses and sedges which are cut and cast under vine as mulch, thus encouraging microbial activity in the soil and reducing the need for herbicides. We encourage natural indigenous insect predators, such as our free roaming guinea fowl. All organic grape waste including cellar water is recycled, and returned to the vineyard either as irrigation water in dry spells, or in the case of solid post wine production waste as post harvest compost. Alien vegetation, why it’s a problem, and our response to it. 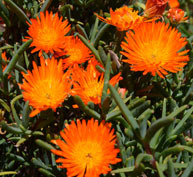 Plants that do not belong here use much of South Africa’s prized water supply. They are called "invading alien" plants. Large areas of our country have been infested with invading alien plants. They have no natural predators and spread with ease. They destroy precious vegetation such as fynbos, When invading alien trees & plants burn, the fires are much more intense than those in indigenous vegetation, resulting in soil damage which, in turn, is then washed into rivers causing the rivers and dams to fill up with silt. At Sumaridge, the eradication of these trees and plants has been carried out for some years. The wood is chipped and incorporated with the farm waste for compost. As the seed bank for these virile plants is enormous, measures have been implemented towards sustainable control. Fallow land is grazed by herds of both Sussex and Dexter cattle. Foreign vegetation encroachment is physically removed from the entire farm on an annual basis. Natural areas are established and fenced, offering protection to indigenous plants and the ecosystem, However, walking, cycling and horse riding are permitted along designated routes both in these areas and the vineyards. 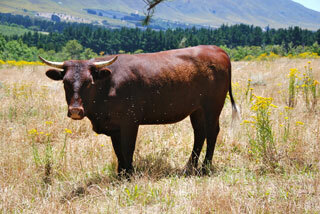 Fallow arable land is fenced off and stocked and grazed by our commercial grass fed beef herd of Sussex cattle. Combined with being well suited to our temperate climate these beasts have an attraction to the perennially invasive Port Jackson Wattle saplings thereby ensuring sustainable control and maximum land use of the dormant vineyard areas. 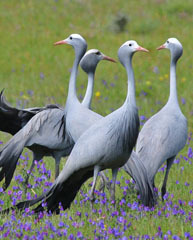 Here on the Sumaridge estate we are proud to have several pairs of breeding blue crane also know as the Stanley or Paradise crane (Anthro-poides paradise). This elegant bird is listed as globally threatened in the international Red Data Book. With more than half the remaining blue cranes found within the Province, the Western Cape can boast the only stable and increasing population of South Africa’s national bird. Other “Western Cape Specials” that you might spot include the orange-breasted sunbird, the Cape sugar bird, Cape siskin, Victorin’s Warbler, the Cape bulbul, the southern tchagra and the protea seed eater. Naturally occuring Fig Marigolds can be found thriving on the farm.